We at MountainWorks feel fortunate to work for and with great people and organizations, as shown on our Clients page. Additionally, we've had wonderful gear support from a number of super companies that we want to thank. The companies that follow support our work in the outdoors, including 1) apps about hunting, fishing, and flora identification; 2) books about backpacking, bike touring, and yoga; and 3) science writing and facilitation in the realms of climate change, Yellowstone bison, native trout in Yellowstone Lake, and more. Because they support our work, we want to extend our thanks to each of the companies below and support their work. Please consider each of these companies when you're looking for your own outdoor gear. Just click on the logos to go to each company's website! 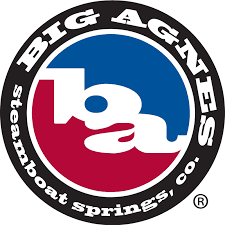 Thanks to Big Agnes, our newest affilitation, whose gear already adorns our packs. What's not to love about a company who says of itself, "We started Big Agnes 18 years ago without a real plan, but with a pretty good idea: to make the best gear possible to help folks like you get outside and chase your dreams. "? Our great appreciation to Outdoor Research for their Pro Deal. OR's core values -- certainly matching our own -- include cultivating respect for each other and the planet, and growing through the challenge of journey. Likewise, great appreciation to Prana for their Pro Deal. Prana is a progressive company supporting all things yoga, and most importantly-- in their words -- "global goodness". And still more appreciation, this time to Ibex Clothing for their Pro Deal. Ibex is/was a progressive company that creates highly functional, great looking outdoor clothing made of wool, a phenomenal natural fiber. We were sorry to learn that Ibex would be closing its doors in 2018, but are hopeful -- as rumored! -- they will be returning soon. And more--our great appreciation to Montbell, who, among much gear, crafted the super lightweight down jackets we love. How could you not like a company whose founder, Isamu Tatsuno, says that in his free time he can "often be found ... playing the Japanese flute" ?! And appreciation to the good folks at Liberty Mountain, purveyors of "everything for the outdoors"! Check them out, they do have everything! Eureka tents, MountainSmith packs, and Danner boots.